I hit the mattress at 1:30 am Saturday morning at the Sheraton after a week that included covering the High Point Market (the bi-annual furniture trade show in North Carolina), bicycling Mt Mitchell (highest point in North America east of the Mississippi) and tidying up my own retail business on Friday. Nonetheless, I was ready to go at the opening bell on Saturday, camcorder and still camera swinging from my neck. The short story is: It was a great show and I died in the aftermath. I started on the second floor, which was actually at ground level coming in from the parking lot. The first door (7204, Nation Imports) was locked. I found out later why this was so, and I'll cover it when I come to my video notes, maybe in Part 2. I gained traction a little further down the hall where I encountered Nola Brio monitors on stands ($1700) supplemented with a pair of subs. $5000 for the entire speaker package, or $3500 with only one sub. Source was an Audio Analogue Maestro CD player feeding a NuPrime amp for $3200. The electronics were stacked on a handsome Massif Audio Designs rack made entirely of wood, right there in Toronto. Dangling off the back of the Nola speakers was a box containing Bybee Quantum Purifiers with a Reference 3A label on it that no doubt contributed to the excellent sound of this rig. I love the open sound of Nola's with open baffle mid/tweeters such as this. The Brio has been widely acclaimed in the past and in this right-size room it was excellent here as well. Jon Finnegan of FoldBack Sound helped me out there. 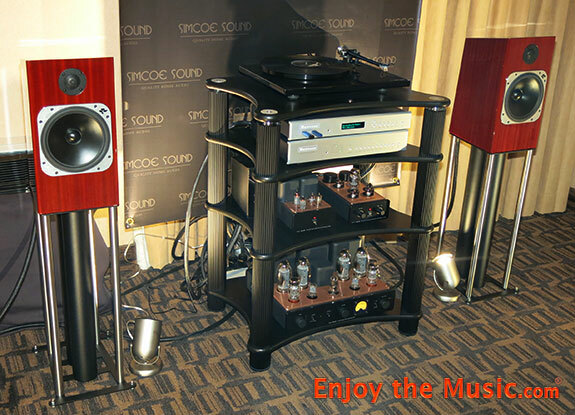 In the Simcoe Sound room (7209) a Rega RP6 turntable was fitted with a Benz Micro Ace cartridge, Bis Cables made the connections in and out of the Icon Audio tube amplifier sporting KT-100 power tubes from Great Britain. I've eyed Icon amps in the past but they've been a rare bird. It's nice to see these well-made amps on this side of the ocean again. The smaller components above the amp are the Icon Super Cascade Phono Stage and its tube power supply, something I should have paid more attention to. Stevie Ray Vaughn playing Tin Pan Alley was sounding mighty good to my tube-centric ears. The 60 Wpc of tube power was plenty to drive the stand mounted Totem Acoustics stand mounted monitors. Totem also had their own room which I finally got to at the end of the day on Sunday. In the Focus Audio room (7217) I had a little trouble identifying the instruments until Kam Leung handed me the CD jewel case identifying the music as A City of Sadness/Soundtrack music by Sens, including an unusual Chinese flute-like instrument. Last year the Focus rig was compromised by a room that was too small for the large speakers they presented. 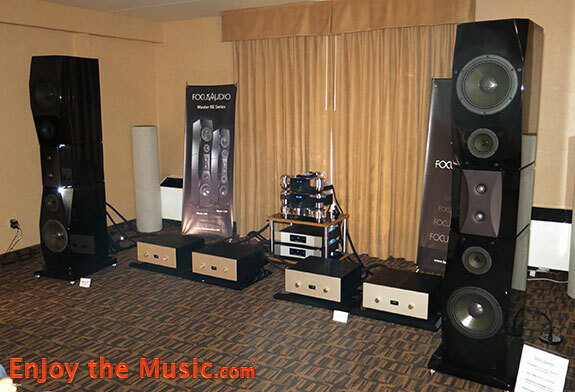 This year, with the even larger Master 2 speaker ($45,000 USD) from their BE Series with Beryllium tweeters, they had a larger room and the sound really came alive. 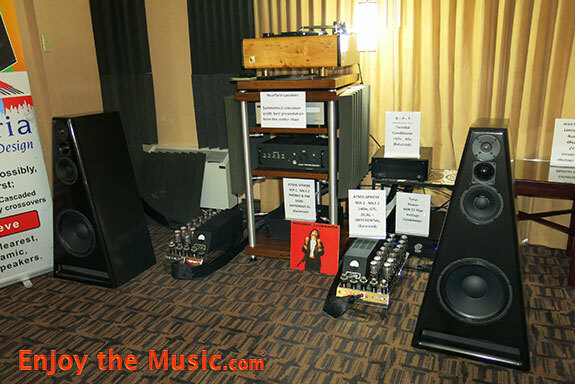 Kam also ran more amplifiers this year, with four of his Liszt Concert Integrated Mono amps delivering 70 Wpc. 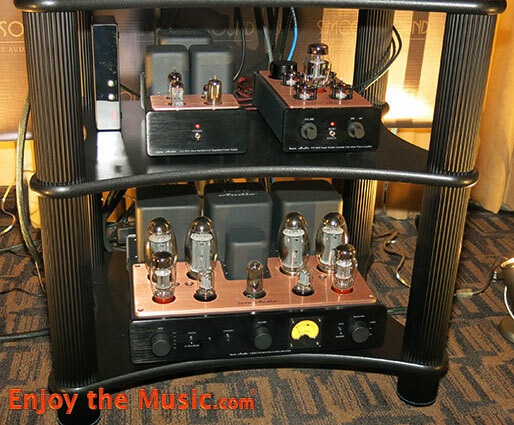 The tube amps were linked to the same remote control for ease of operation and cost $25,000 USD/pr. 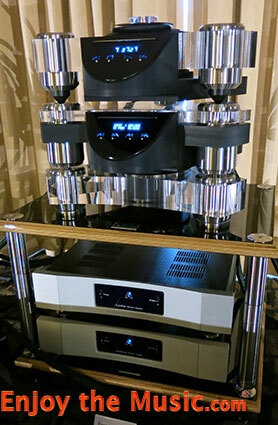 The source was a Metronome Technologie Kalista Signature transport and DAC from France, a statement product and a beautiful to behold stack of clear acrylic. Those would be the separate power supplies for the Transport and DAC in the handsome Foundation Audio rack. The cables were from Absolute Creations, also from France, which, judging from the sound, were very good also. Clearly, Kam did not hold back at all this year and the presentation was one of the Best Rooms at the show. And while it was certainly expensive, it held its weight against much more expensive rigs I've heard. 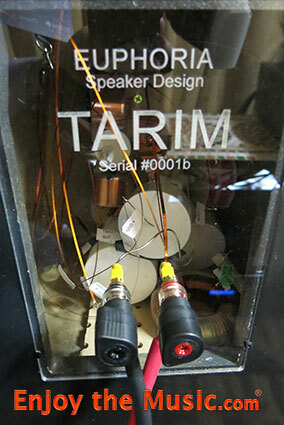 William (Bill) Laleff of Euphoria Speaker Design (room 7216) showed up with a new speaker, the Tarim, with a symmetrical, dual-differential four-way crossover he makes in nearby Brampton, Ontario. A Plexiglas cover allowed a peek inside. With this crossover it is designed to be used with balanced amplification, hence the Atmosphere MP-1 preamp and MA-1 Mk3.2 monoblocks. It can be used with a single ended amp, but you will not get the same holographic presentation as I heard here. To tie it all together he has designed his own power cords, speaker cables and interconnects and he uses Furutech binding posts on his speakers. At $11,200 CDN it is much more affordable than the Watt/Puppy-like design he had previously been developing and this one sounded noticeably better than his earlier efforts. 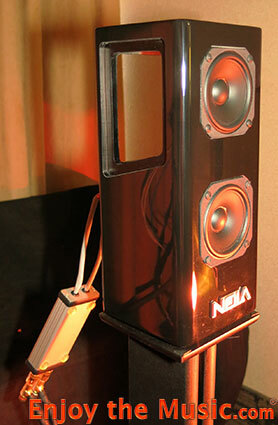 I liked the two-tone black finish and noted the slot port on the front of the speaker at floor level. The front end was the eye-catching Jean Nantais modified Lenco turntable with Kuzma 4-Point tonearm and ZYX Universe cartridge. As we grooved to a Melissa Etheridge cut I noticed he was using both a Balanced Power Technology power conditioner and Torus AVR-15 Plus Voltage Conditioner. I should have asked him more about that. Very good sound here and this speaker should move his company forward.